Eduardo Chillida's Collage is a fine example of European mid-century modern abstract expressionism. 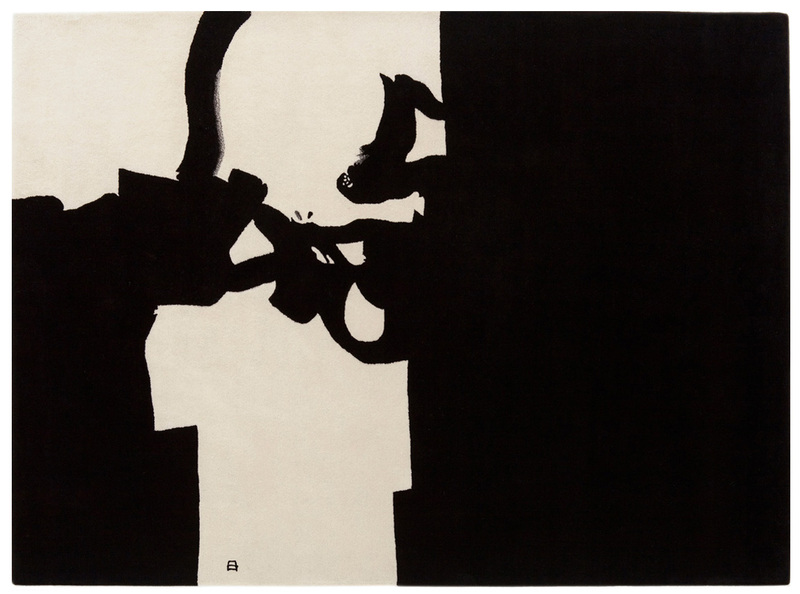 Collage was designed by the Spanish artist Eduardo Chillida in 1966 and expresses the actions of the artist through dramatic and boldly gestural brushstrokes against a minimalist background. Collage is a fine example of Eduardo Chillida's philisophy; that is that the negative and the positive space which the work inhabits, and which the work defines, is really important. Collage's interaction with its surrounding is fundamental to Chillida's artistic vision. 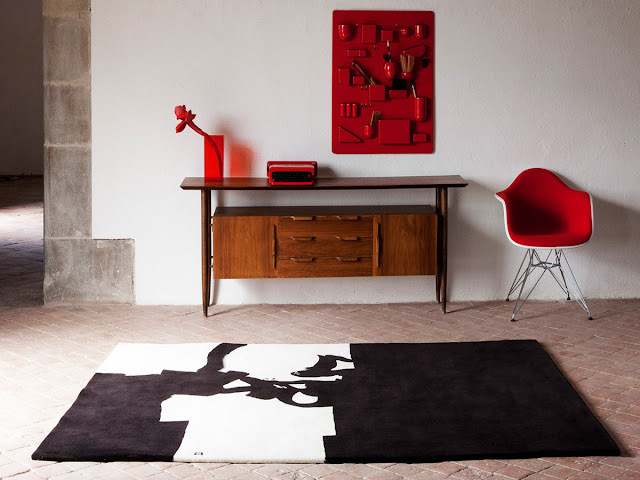 We feel incredibly fortunate to bring this fine Eduardo Chillida rug to the market. Equally stunning on the floor or as a veritable piece of modern art when hung on the wall. This brilliant creation will compliment any refined interior design. Eduardo Chillida, born in 1924, is ranked among the most acclaimed sculptors of the second half of the 20th century. His Collage from 1966 is a fine example of the abstract expressionist movement that included Robert Motherwell, Jackson Pollock, Mark Rothko, Willem de Kooning and Philip Guston. Eduardo Chillida spent the early years of his artistic career in Paris, where Ancient Greek sculpture as well as the works of avant-garde masters like Gaston Lachaise, Le Corbusier and Picasso really influenced his work. Chillida is regarded as a vanguard among his contemporaries for the dialog he created between monumental works and their surrounding spaces. His work is characterized by elemental forms, pared down to satisfy his essentially ascetic vision. 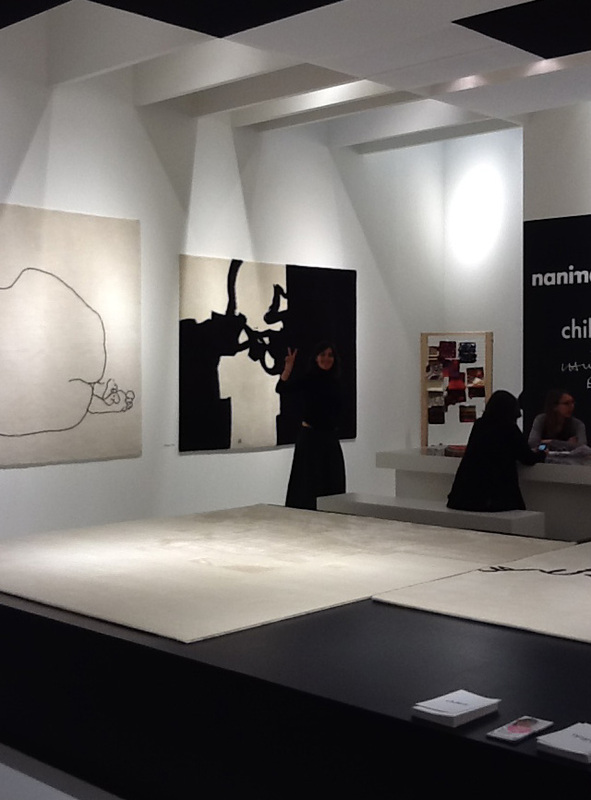 The exceptional collection of Chillida area rugs by Nanimarquina is based on a chronological selection of Chillida's most celebrated works. These modern works of art are accurately translated by Nanimarquina into fine area rugs which can also be used as decorative wall art. All of these fine rugs are handmade using various techniques and different materials like wool, silk and mohair. Each rug is fully authorized the by Eduardo Chillida's estate and takes several master rug artisans up to 12 weeks to create.